SCP-3670, after cleaning to remove residue from prior testing. Special Containment Procedures: SCP-3670 is currently contained in a standard Safe-Class Object Locker at Site-43. Due to unacceptable risk of collateral damage, testing has been suspended until further notice (see logs for further details). 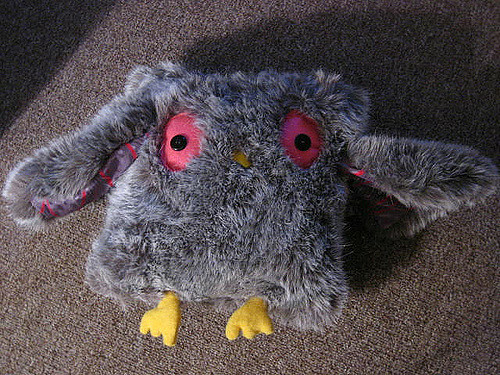 Description: SCP-3670 is a small, owl-shaped throw pillow. Testing indicates that the fur-like material which covers much of its surface is an unusual derivative of corn leaves, as is its stuffing. SCP-3670's anomalous effects occur whenever a human subject sleeps with their head resting on it for more than six hours. When the subject awakens, SCP-3670 will attempt to fulfill a desire the subject had immediately prior to falling asleep. This is accomplished via the anomalous manifestation and transportation of matter. To avoid the possibility of malicious requests, Researcher Srin Dakshinamurthy volunteered as the test subject. She agreed to the implantation of memetic compulsions to further reduce this risk. An abridged log of testing follows. Result: A bowl of creamed corn, with gluten-free toast. Notably, subject has coeliac disease, which prevents safe digestion of gluten. Result: A bowl of cold creamed corn, served with a scoop of vanilla ice cream. Request: A cup of coffee. Result: A cup of hot creamed corn, covered with milk. Request: Twenty dollars in U.S. legal tender. Result: A bill of unknown worth that had been damaged beyond legibility by submersion in creamed corn. Degradation of ink due to liquid damage made it impossible to verify the bill's legal value. Request: Something that isn't creamed corn. Result: Creamed corn replaced Researcher Dakshinamurthy's provided food rations. Subject reported it tasted 'bitter'. Result: The fuel tank of the subject's Prius was filled with approximately 39 liters of highly pressurised creamed corn, a replacement which was only discovered when she attempted to start it. Management declined her request for reimbursement. Result: The cadaver of a Golden Retriever. Cause of death identified to be asphyxiation due to large amounts of creamed corn lodged in its airways. Request: The location of PoI-1928, an escaped captive. Result: After an anonymous tip was left on Researcher Dakshinamurthy's voicemail, Foundation agents found PoI-1928 dead in his room at the Astoria Motel 6. Bruising on his neck indicated he was strangled to death by an unknown assailant; autopsy indicated his stomach had been filled with 23 liters of creamed corn. Notably, creamed corn residue was found leading back to the drainpipe of the bathroom. Request: That SCP-682 be terminated. Result: See Post-Breach Report: Structural Integrity of Site-19's Interior Following Corn Manifestation Incident1. Request: A bowl of creamed corn. Result: A plastic tray containing a bowl of creamed corn, a stainless-steel spoon and a 'Get Well Soon' card addressed to Researcher Dakshinamurthy. Supervising agent Delwick sustained minor first-degree burns to the face during an attempt to secure the subject's cooperation. The subject refused all subsequent requests to consume the creamed corn. 1. Notably, SCP-1846 was unharmed in the breach.